A: First of all I shall make a clarification. As I understand, relevant Australian people did attend the Boao Forum for Asia (BFA) annual conference 2018. The BFA is an unofficial international conference organization. Its Secretariat is responsible for relevant activities and inviting the representatives from the political, academic and business communities of other countries. You may want to refer to the BFA Secretariat for the attendants' information, including Australia's participation in this BFA annual conference. You mentioned the China-Australia relations and Australia's ongoing attempt to legislate against foreign interference, my colleagues and I already stated our position on such issue. 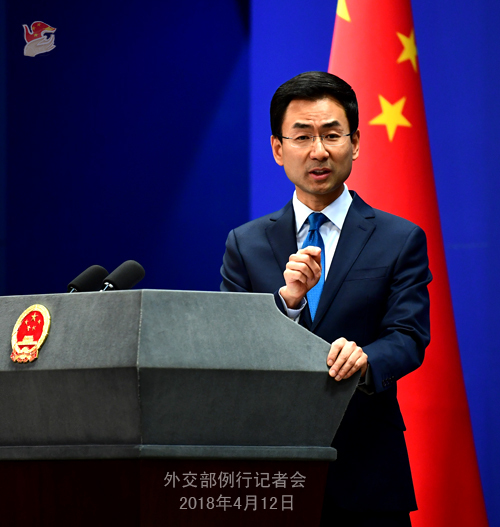 China stays committed to developing friendly relations with countries around the globe on the basis of the Five Principles of Peaceful Coexistence, including mutual respect and non-interference in each other's internal affairs. Any accusation against China of so-called "interference" or "infiltration" is totally groundless and out of ulterior motives. 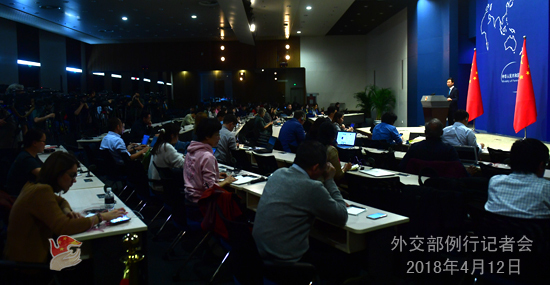 We hope the relevant party will respect objective facts and put China's development in perspective. A sound and steady China-Australia relationship serves the fundamental interests of the two peoples. We hope Australia will work with China on the basis of mutual respect and treating each other as equals to better enhance our mutual trust and cooperation, so as to ensure the China-Australia relations move forward in the right track. Q: According to reports, Russian officials said that they will deploy military forces in the town of Douma, Syria. If the US strikes Syria, any US missile fired at Syria and its source would be shot down and destroyed. In response, the US said its military is ready to provide the President with military options if appropriate and at the President's request. A military conflict over the suspected chemical weapons attack in Syria becomes more likely. What's your comment? A: Days ago, State Councilor and Foreign Minister Wang Yi exchanged in-depth views on the tense situation in Syria with the UN Secretary-General Antonio Guterres in Beijing. 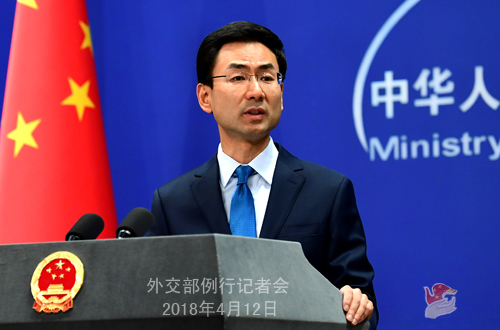 Recently China has been in close communication with the US, Russia and other members of the UN Security Council and countries in the region on the latest development of the situation in Syria. China is worried about the possibility of the escalation of tension in Syria. We always stand for peaceful settlement of disputes, oppose wanton use or threat of use of force in international relations and advocate acting in accordance with the UN Charter. As we understand, the Organization for the Prohibition of Chemical Weapons will soon send experts for investigation on the ground. We call on parties to remain calm and restrained to ease the tension as soon as possible. Q: On March 27, a Norwegian citizen was arrested for smuggling salmon into China from Vietnam. This person allegedly has two passports. I wonder if she was arrested as a Norwegian or a Chinese citizen? How serious is the crime from China's point of view? Will it affect China' relationship with Norway and the bilateral trade ties? Do you know if she was acting alone or with a Norwegian company together with her and what are the charges against her? A: I am not aware of the situation you mentioned, but I can check on it after this press conference. I can tell you that China-Norway relations are developing smoothly and the two countries are having normal cooperation in various fields.